Title IX requires that the University forgives absenses for pregnant students that are deemed medically necessary by the student's doctor. The Title IX Coordinator recieves a lot of questions as to how faculty should structure their attendance policies to make sure they are Title IX compliant. Below are three sample attendance policies that faculty can use or modify at their discretion. Students are expected to attend class and actively participate in all aspects of the learning process. This includes class discussions, written work, and in-class activities. National and local studies have shown a direct correlation between attendance and grade performance. Therefore, attendance is considered mandatory. Students who miss more than 10% of the regularly scheduled class meetings due to unexcused absences are subject to failing the course. 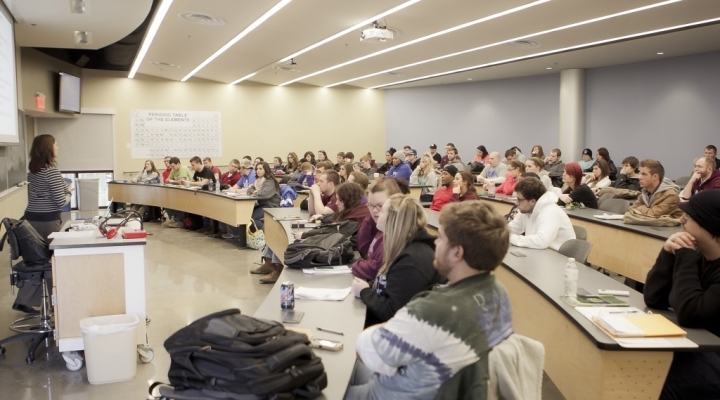 Students enrolled in TR sections may not exceed 3 unexcused absences for the semester. Students enrolled in a MWF section may not exceed 5 unexcused absences for the semester. For the purposes of this course, "excused absences" include verifiable medical or family emergencies, University approved activities (accompanied by a University excuse), illness (yours or a family member’s), and other absences as outlined in the University’s “Student Absence from Class” policy. Students should be prepared to document the reasons for the absence. Students whose absences are not excused will not normally be allowed to make up tests, quizzes, and/or assignments. Students who anticipate having a high number of excused absences should contact their instructor as soon as the situation arises so that they can make arrangements for how to handle missed class time. Late arrival or early departures from class that are unexcused will be considered in the tabulation of absences as well. Students with unexcused absences are subject to failing the course. For the purposes of this course, "excused absences" include verifiable medical or family emergencies, University approved activities (accompanied by a University excuse), illness (yours or a family member’s), and other absences as outlined in the University’s “Student Absence from Class” policy. Students should be prepared to document the reasons for the absence. Students whose absences are not excused will not normally be allowed to make up tests, quizzes, and/or assignments. Students should make every effort to attend every class meeting. In the case of an excused absence with proper documentation, extended deadlines or alternate activities will be provided for any graded activities. However, these accommodations do not always provide equivalent learning opportunities. An acceptable excuse is a doctor’s excuse, a University excuse, or a catastrophic emergency resulting in unavoidable absence. Arrangements to complete alternate activities, such as another version of an exam, must be made within one week of returning to class; otherwise, a zero will be recorded.